Let’s fish is a fast, fun and friendly free to play fishing MMO that encourages players to work together with the community and competing with each other in friendly competition. The game can be played in your Internet browser, accessible on your PC and tablet, and is a casual game to spend a few minutes playing here and there or a couple of hours as you try to track down rare and hard to catch fish! 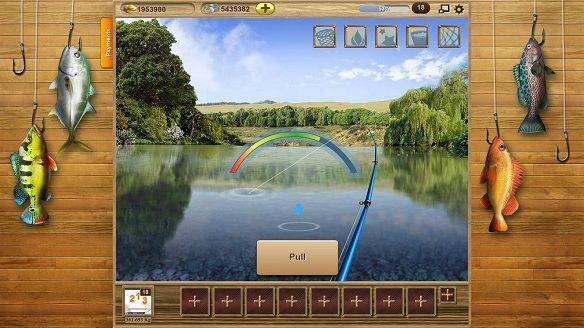 With colourful graphics, enjoyable sound effects and simple gameplay it is ideal for any young fishing fanatics. With a global chat channel players are able to speak to each other, help each other and share their achievements with the rest of the community, players are also able to enter tournaments and competitions with each other for prizes. The game itself is very simple and revolves around the player trying to catch as many fish as they can from various locations that they will travel to in various different countries. Let’s fish has an extensive achievement based system where players are able to work towards completing these achievements in their own pace; when successful they are rewarded with XP and bonuses! These achievements can be anything from catching 10 of the same named fish or successfully landing every type of fish in a particular location. The mechanics are very easy to pick up and are simply performed by casting your line with them button click and then repeatedly pressing the mouse button to reel in your fish before it gets away! The most enjoyable part of the game is working out what fishing tackle you will need to catch a particular type of fish. There are four primary types of fishing gear that each fisherman or fisher woman will need: a rod, a line, a hook and some bait. Depending on the different combinations of gear you choose it will determine which fish you are able to catch, a rod and line will typically determine what weight of fish you are able to catch with it as more lightweight rods and lines can only catch small fish, whereas your hook and bait will determine which type of fish you will catch as specific fish are only keen on eating certain types of bait e.g. bread, corn and even worms! Throughout the game players will earn in game coins that they can spend at the shop to buy new gear for their different fishing trips. Certain items can only be accessed using the premium currency (bought with real cash, but also earned through gameplay by performing key actions such as levelling up), for example players can buy a net which will help them catch bigger fish or unique bait to catch rarer and more elusive types of fish. Players are even able to buy their own fishing boats!